Earlier today, Tom Frieden, M.D., M.P.H., director of the CDC, joined leading medical and public health experts at the National Foundation of Infectious Diseases (NFID) News Conference to discuss the upcoming 2016-2017 flu season and vaccination coverage results from last season. While flu season doesn’t “officially” begin until October 1st, Dr. Frieden reminded the public that the flu is unpredictable and there is no way to know when the virus will be circulating in your community. This is why experts recommend getting yourself and your family members vaccinated now. During his opening remarks, Dr. Frieden explained that the CDC has already tested 5,000 viruses and has begun to identify cases of flu across the U.S. While it appears that this year’s vaccine will be a good match to the strains that were circulating at the end of last year, he explained that there’s no way to predict what type of flu season we will have in 2016-2017. The best that we can do is to be get vaccinated. Dr. Frieden conceded that flu vaccination is not perfect. While we all wish it were better, he urged everyone over 6 months of age to get vaccinated since a flu vaccine can reduce a person’s risk of flu by at least 50%. Flu vaccination also substantially reduces the risk of hospitalizations and other complications, while also reducing the risk of death. 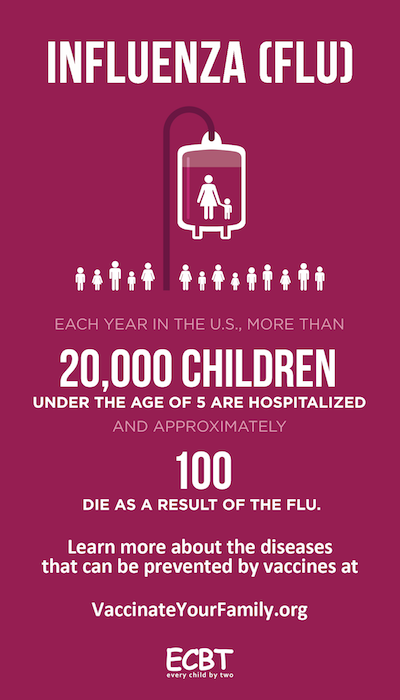 In a bad year, the flu kills up to 49,000 Americans, 100 of which are infants and children. Sadly, about 90% of the children who have lost their lives to flu were unvaccinated. The most promising statement Dr. Frieden made in his opening remarks helped illustrate the enormous impact flu vaccination can have on our health and our communities. Over the years, we’ve been making progress in increasing flu vaccination rates, however there is still plenty of room for improvement. For example, Patricia Whitley-Williams, M.D., NFID Vice President and Division Chief and Professor of Pediatrics at Rutgers Robert Wood Johnson Medical School, stated that ten years ago only about 10-20% of children ages 6-23 months of age were vaccinated against flu. In contrast, last year about 75% of kids in that same age group were vaccinated for flu, exceeding our national public health goal. Unfortunately, the goal has yet to be met in other age groups. Dr. Whitley-Williams explained that as kids get older, flu vaccination rates tend to decline, with only 47% of children 13-17 years being vaccinated last year. This has had a direct impact on the 20,000 kids under the age of 5 who are hospitalized with flu related complications in this country every year. While roughly 46% of people over the age of 6 months old were vaccinated last season, there were still 30 million kids that didn’t get a flu vaccine. We are making progress among healthcare workers as well. The data indicates that 9 out of 10 healthcare workers were vaccinated last year, and there was also a slight increase in coverage among healthcare personnel working in long-term care settings such as nursing homes. Yet, flu vaccination rates among adults age 50 and above decreased by 3% last year. Wilbur H. Chen, M.D., Associate Professor, University of Maryland School of Medicine concluded the news conference by address the concerns of a growing adult population. The number of people age 60 and older will soon outnumber children 5 and under, and the concern is that this older demographic is often the hardest hit by flu. Approximately 70-90% of influenza deaths occur among people 65 and older, and 50-75% of flu related hospitalizations occur in this age bracket as well. While people are living longer, they can’t avoid the fact that our immunological peak appears to occur somewhere around age 45. As a person ages, their immune system begins to decline resulting in higher rates of infection, more severe infections, and a lesser immune response when vaccinated. At an age when flu vaccination is vitally important, only 63% of adults over 65 were vaccinated for flu last season. Flu vaccination is an effective way to reduce illness and hospitalizations among this age group, while also helping to prevent other health complications such as heart attack and stroke. Since pneumococcal and flu often go together, Dr. Chen suggested that older adults consider getting a pneumococcal vaccine in addition to their annual flu vaccine, if they haven’t already done so. There are two different pneumococcal vaccines that are recommended to the public; the first is for everyone 65 and over, while the other is for those under age 65 with certain health conditions. While pneumococcal sends half a million people to the hospital each year, 4 out of 10 Americans over 65 still haven’t received a pneumococcal vaccine. Experts continue to emphasize the benefits of flu vaccination among pregnant women. Expectant woman are six times more likely to die from flu when pregnant, and contracting the flu during pregnancy can result in dangerous complications, to include pre-term labor. Studies have shown that vaccinating pregnant woman can help protect the mother and her pregnancy while also transferring passive immunity on to their babies which can help protect them against flu for several months after they are born, while they are too young to be vaccinated themselves. While flu vaccination coverage for pregnant women remained similar to previous season at 49.9%, this statitic measn that nearly half of all pregnant women and their babies are not protected from flu. One of the biggest changes in the flu vaccine recommendations for the 2016-2017 season involves the elimination of the use of the nasal spray flu vaccine this year. It’s estimated that approximately 20 million people, out of the 144 million that were vaccinated for flu last year, received the live attenuated influenza vaccine (LAIV) known as the nasal spray flu vaccine. During the press conference, Dr. Wendy Sue Swanson estimated that about one-third of kids vaccinated for flu last year got the nasal spray flu vaccine. While many parents opt for their children to receive the nasal mist over an injectable flu vaccine, Dr. Frieden explained how and why the Advisory Committee on Immunization Practices (ACIP) came to their decision not to recommend the nasal spray flu vaccine this year. He stated that initial research data suggested that the nasal spray was expected to be highly effective, maybe even more effective than a flu shot. However, after evaluating data from various vaccine efficacy studies the evidence was clear. The flu mist did not provide a great deal of protection. While this is puzzling to the public health community, and scientists have several theories that may one day help explain this phenomenon, the most responsible course of action was for the ACIP to no longer recommend using the nasal spray flu vaccine for the foreseeable future. Experts tend to agree that it is better for the ACIP to be transparent and proactive in protecting people’s healthy by restricting them from getting a flu vaccine that has little efficacy, when there are other flu vaccines available that have demonstrated a much greater efficacy. If you normally opt for nasal spray flu vaccine for your children, it’s important that you continue to protect them with a different flu vaccine this season. Kids have received shots before, and will need to receive them throughout their lifetime, so while the mist may have been convenient, parents will need to help their children understand that the minor and temporary discomfort of a flu shot is worth the protection that the vaccine provides. Dr. Frieden, Director of the CDC, gets his annual flu shot at the conclusion of the NFID Influenza News Conference. In closing, Dr. Frieden assured the public that there were plenty of flu vaccines available, but urged people not to wait. We’ll be sharing this image of Dr. Frieden getting his flu vaccine and we encourage you to do the same. 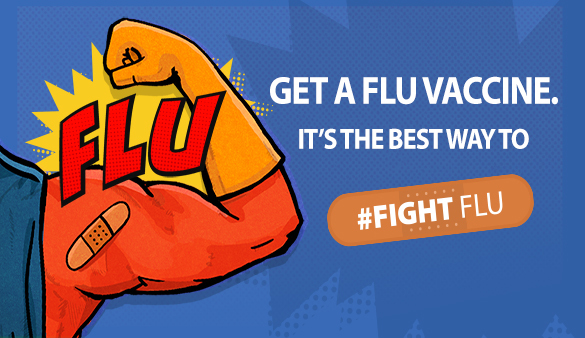 Capture the moment when you or your family members get a flu shot and then post it to all your social media accounts with the hashtag #FightFlu. Let’s see how many people we can encourage to get their flu shots this year.